Have you ever gone to the movies and the film did absolutely nothing for you? It's not that the film is bad; it's that film fails to excite you. It doesn't capture your imagination; you don't buy into it, and in the end you ask, "Who cares?" I saw this film five days ago, but couldn't be bothered to write anything about it. Actually I didn't have anything to write about it. I didn't care, so it's difficult to believe anybody else would care. Let's look at what it's got going for it. Rotten Tomatoes gave it 70% would should be a respectable rating. Joe Wright, the director, also did 2005's Pride and Prejudice and 2007's Atonement. Saoirse Ronan co-starred in the film Atonement which gave her nominations for a BAFTA, a Golden Globe and an Academy Award for Best Supporting Actress. Her portrayal in Peter Jackson's The Lovely Bones (2009) garnered her a second nomination for a BAFTA. Does Cate Blanchett need an introduction? Amongst many other awards, she won a Best Supporting Actress Oscar in 2004 for playing Katharine Hepburn in The Aviator. Eric Bana has a number of well known projects under his belt including Blackhawk Down, Hulk, Troy, Steven Spielberg's Munich, and The Time Traveler's Wife. What about the story? You'll always hear me coming back to the story as I don't care about the budget, the actors, or the special effects. If you ain't got a story, it ain't going to work. I respect Roger Ebert and he gave it three and a half stars out of four. In his review, he said, "Hanna is a first-rate thriller about the drawbacks of home schooling." Okay, the reference to home schooling is a bit of a joke, but I'm afraid I disagree with Mr. Ebert about first-rate. Don't worry; this isn't going to be much of a spoiler. Hanna is raised in the wilderness by her father and has never known the rest of the world. Due to a convoluted connection, she ends up being first captured by the CIA, and then chased after escaping. Several people die. She wins. It turns out she's special and as one reviewer labelled her, she's a killing machine. She's supposed to be 16 years old. A killing machine. Right. Yawn. Who cares. Don't bother. I wouldn't recommend you go to the movies to see this and I'm not sure I would even recommend renting it to watch it at home. There are a lot of movies made every year and since we can't watch them all, let's be selective of how we spend our time. Life is short. Let's eat dessert first. Or let's watch all the really, really good films first then move on the B movies if we run out A listers. 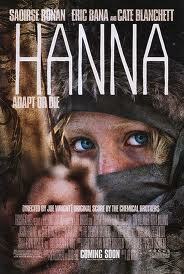 Hanna received generally positive reviews. It holds a 70% favorable rating on Rotten Tomatoes based on 128 reviews with the consensus stating "Fantastic acting and crisply choreographed action sequences propel this unique, cool take on the revenge thriller." Justin Chang of Variety states that "Joe Wright's 'Hanna' is an exuberantly crafted chase thriller that pulses with energy from its adrenaline-pumping first minutes to its muted bang of a finish." Roger Ebert also provided positive feedback commenting "Wright combines his two genres into a stylish exercise that perversely includes some sentiment and insight". The Commodore 64 is making a comeback. What!?! Forsyth and Parov: I just gotta dance!